your support of our SPONSORS! Space available for your ADs! 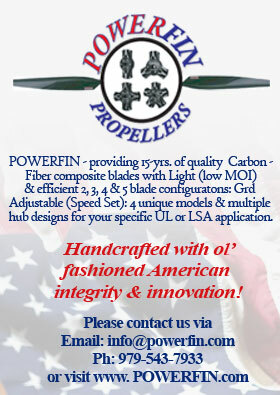 Below are records set by www.powerchutes.com readers and emailing list subscribers. Many records are unofficial and are recorded on the honor system. If you have a record you would like to submit, email with photo if possible. Please do not take unnecessary risks while pursuing a record. On March 17th 2001, Steve Thomas completed a cross country flight 2,464 statute mile flight from Oceanside, California to Jekyll Island, Georgia. Ed had previously set the record with almost 16,000 ft. 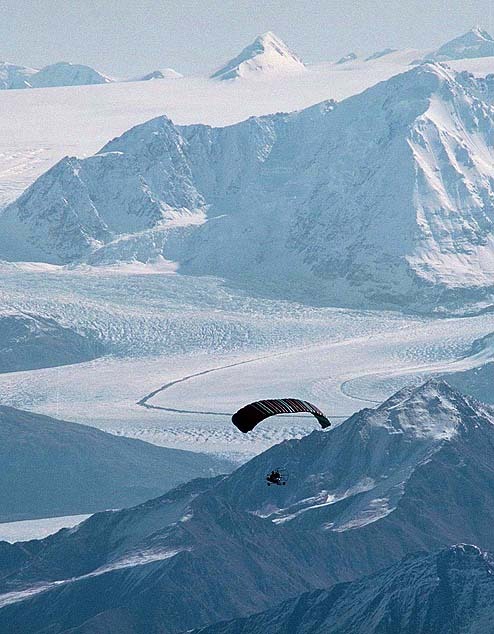 In 2001 Bud Gish broke the record in Alaska with a highly modified Six Chuter. Ed talked with Eddie Johnson, the president of Powrachute, and they agreed that we could probably do it with a stock Pegasus. Thursday the 17th rolled around and Eric and Ed came over to get oxygen for the long haul up. We didn’t know that you had to have a prescription for oxygen. So I called my dad at the Hospital, he is a Nurse anesthetist and asked if one of the doctors could write a prescription. As it turned out, all the doctors had left surgery for the day. I ended up calling a friend who was a pilot and a doctor to see what he could do. He wasn’t to keen on writing us a prescription, but did call the Macomb airport to try and find an oxygen tank. All they had was an old 20-pound tank without a regulator. At this point we were starting to worry. Finally a paramedic called me and said that he had a small tank in a kit at his house. Finally everything was in place, and we were feeling pretty good! On Friday most of the pilots showed up. It was windy and overcast so; we decided to go out to eat at a pizzeria. After dinner the winds had calmed and we were able to get about an hour flight in. Friday morning all the pilots showed up well rested and ready to fly. I used Ed’s PC 2000 to lead the way on a cross country to Argyle Lake state park while Ed stayed on the ground to get my Pegasus ready for its record breaking flight. The flight was very smooth that morning and the scenery west of Macomb was beautiful. To compensate for the high altitude Ed put a carb compensation kit on each of the carburetors. This allowed him to richen up the mixture the higher he went. We also Put a Sky Bolt 430 on for max climb. At about ten we landed form the cross-country. Buy 11:00 Ed was ready. After getting into several layers of clothes and a hardy coverall Ed was sweating pretty bad. He wedged the oxygen tank under the seat and set the altimeter to 630 msl and was off by 11:17. The crowd cheered him on. Eddie Johnson and I tried to follow him up in the 912 Pegasus, but he had too much of a head start on us. We were able to see him most of the way up, but eventually he turned into a white speck. After about an hour and a half we were starting to get anxious. Walt Meziere had flown his Comanche up from Texas for the day so he and Eddie went out looking for Ed. They got up to 17,800 and saw him once and decided to come back down. We finally saw Ed getting closer while doing one of his famous Spirals. He landed with out power, and I must say it was one smooth landing. Everybody ran out to see if he made it. The total flight time was 2 hours 33 minutes. He ran out of fuel at what the EIS said was 17,870,MSL but was actually 20,287 MSL, and it was a good thing that he did, because when he landed there had about an 1/8 of an inch of oil in the oil bottle. The first thing Ed did when he landed was to get his shoes and socks off and to go stand on the warm cement. The temperature got down to –30 degrees, and at that temperature your camera freezes up so, we weren’t able to get any high altitude pictures. Ed also set the record for the longest engine out at? Ed was walking on cloud 9 that day He had finally got his record back! Orville Behrenwald of Lakeview Michigan is I believe the oldest student pilot to own and pilot a Buckeye 582 Dream Machine. 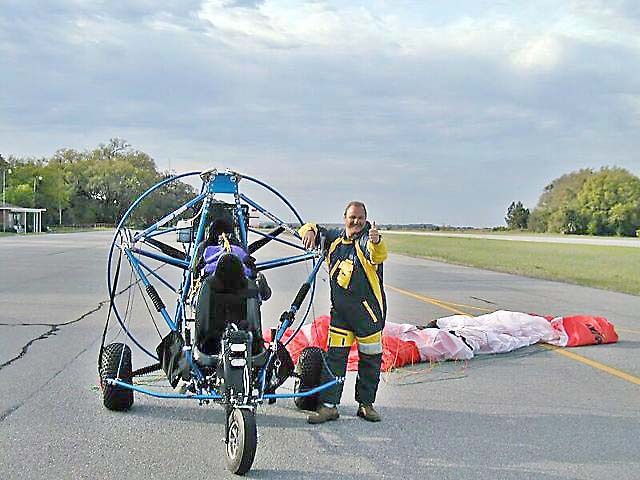 Orville came to Steve's powered parachute Sales in Remus Mich. After a introductry flight Orville wanted to purchase a machine. 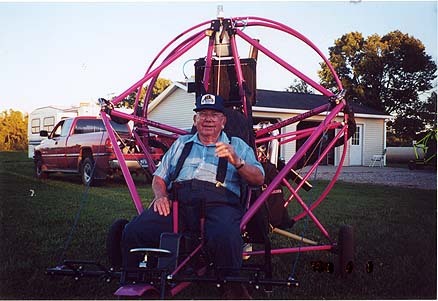 On Sept 9,2000 he soloed at Mecosta Airport, Orville is 91 years young. Good Job Orville on a great solo flight. The Altitude Record that I set in April was broken on September 9, 2000. The new record is 17671 feet. Set using my Six Chuter SR-2 / PD Sunriser Canopy /with a Rotax 503 DCDI which I have modified with Shaved heads, Tuned Exhaust, In-flight Adjustable Ivo Prop, On Board Mixture Control (Arctic Sparrow Aircraft Inc.) and running a mixture of 50% Trick 114 racing fuel and 50% Super unleaded Gasoline. I also used a potenially dangerous experimental add - on that I invented: Oxygen Injection. I spent a considerable amount of time with the Gases specialists at Air Liquide to derive a safe method of using my O2 system without blowing myself up. Pure Oxygen is extremely unstable when mixed with hydrocarbon fuel's and should not be used by anyone without a through understanding of the element's involved. As it turned out the O2 system that I used did help some, but I can't say how much and I would not recommend it's use. The max climb recorded by my Electronic Barograph was 1083 feet per / minute early in the flight and diminished steadily with altitude. My final climb rate when the engine ran out of fuel was showing only 20 feet per / minute. The total flight time was 2 hr.s 20 min.s 1 second. The climbing portion of the flight lasted 1 hr. 48 min.s 44 second's, leaving an engine off glide time of 31 min.s, 17 second's. In this series of record attempt's I received help from many people ranging from technical assistance to sponsorships. I would like to thank the following Sponsors for making these flight's possible: United Freight and Transport Inc. - My Day Job - Cash contributor for Engine Modifications, and the time off work to make these attempt's possible. Flytec America - Flytec 4020 Professional Electronic Barograph and Technical Support in the use of the above mentioned Barograph. 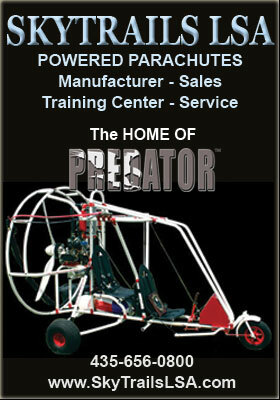 (For information about Flytec's line of products call Steve Kroop / Flytec America at: 1-800-662-2449 or http://www.flytec.com/ Performance Design's Inc. - Technical Support and the use of a new PD Barnstormer for used on the time to climb attempts, 0 to 3000 meter's made on 8/10/2000 Contact Performance Design's Inc. at: (904) 738-2224 or http://www.performancedesigns.com/ Air Liquide America Corporation - Technical Support with the Oxygen Injection System and Aviator's Breathing Oxygen Arctic Sparrow Aircraft - On Board Mixture Control, Part's, Pieces and a ton of Technical Support. Special Thanks to Mike Jacober for Serving as Official Observer for my record setting activities. For Information about Arctic Sparrow Aircraft Products contact Mike Jacober at: (907) 688-7001 Anchorage Drag Bike and Performance Products - Technical Support, Engine Modification's, Trick Racing fuel and mixture recommendations. The official record claim was submitted to NAA on 9/11/2000. Line Socks, Chute bag, etc. radio's, helmets, chute lights, etc. Rate of climb an astonishing 400 fpm (I'm still amazed on this one) 5800ish rpm for level flight. PS I am starting my diet to get skinny for the National Competitions. This is a short story of my no power decent. After lifting off, I set a goal to see how high I could climb. With only 25 hours on my new SR2, I climbed to a height of 11,000 MSL on a picture perfect Sunday morning just after sunrise. Upon reaching this height, and enjoying the scenic view, I checked my fuel and realized that I had only about 2 gallons left. So, to conserve fuel on my slow decent, I turned the motor off and floated gracefully back to earth. The place and quiet with the wind in my hair, gave me the true feeling of flying. After 40 to 50 minutes of decent and at an altitude of 1,000 MSL on final to my landing strip, I turned the ignition on, gave my 503, three pulls on the starter rope, she fired right up, and I made a perfect landing. My air strip is at 496 MSL. So, I consider my record is 10,500 ft. Decent without power. Doyne (Hotwheels) Perry, 2-26-00 Death Valley California. On Saturday Feb.26 2000, the Las Vegas Cloud Chuters, flew at the altitude of 211 feet below sealevel. Our original goal was to fly down to BadWater for a flight at 280 feet below sealevel, but we were unable to obtain that goal due to the rigid rules of the Park Service of 2000 ft AGL. We were able to fly at 211 feet below sealevel by doing low level flights across the runway on aproach for landing at the Furnace Creek Airport. Those making the flight at 211 feet below sealevel were: Cheryl and Lance (Pappy) Atcheson AFI Robert (VaporLock) Campbell BFI Doyne (Hotwheels) Perry Michael (Rockey) Reynolds Fred (Lefty) Polaco Joe (Giuseppe) Castiglia Nattawal (Nat) Charoonsri Jannette and Lonnie (Buckeye) Childers Our weekend was marred by the attitude of the Park Rangers at Furnace Creek who stated that there had been several complaints from the people in the campground concerning the parachutes in the shy. We explained to the Rangers that all of our flights were above the 2000 feet minimun altitude, but he really did not want to hear that. While the Park Ranger was giving us a hard time, several of the Campers from the Campground spoke up for us and stated they had spoke with nearly all of the campers and no one had made complaints, and they were going to the office to put in written letters of praise for the Powered Parachutes. This really upset the Park Rangers, because they did not want us in their airspace, even though no other planes were flying there. The Furnace Creek Park Rangers suggested that we trailer our PPC's down to StovePipe Wells, and use that airstrip for our flights. We took their suggestion and went to StovePipe Wells. We stopped and introduced ourselves to the Park Rangers there, who consequently was not a general aviation pilot, who told us to enjoy our flights and that it was OK to do touch and go's on the airstrip. We were the only planes in the air and we had the ranger's blessings. We ask the Rangers at StovePipe Wells about any complaints that may have been received at Furnace Creek and we were informed that there had been no complaints made. It became very obvious that the Rangers at Furnace Creek were general aviation pilots who did not think we had any rights to be in their airspace. Despite the problems with the Rangers at Furnace Creek, we still had a great weekend. 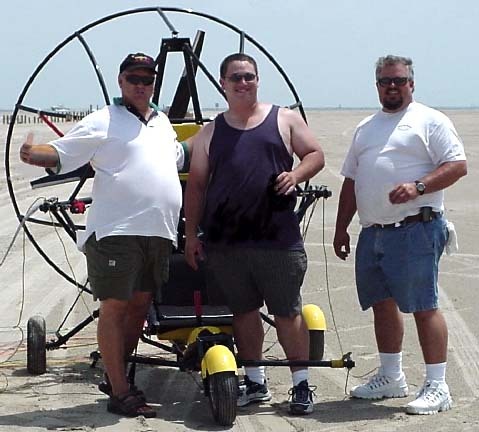 On Sunday, April 9, 2000 a team from Fort Worth Texas began the quest for the PPC endurance record. Gene Long AFI Team Leader Jack Arnold BFI Pilot Chris Taylor Student Jerry Bailey Student Gene Long writes a monthly article for Aero Connections Magazine, and is the Buckeye Dealer in Fort Worth Texas. We started before dawn at the Parker Airport in Weatherford Texas. After the preflight was done, Jack Arnold took off in his Buckeye 582 Dream Machine with ten gallons of fuel. For safety reasons, the first hour would be around the airport. Gene Long and Chris Taylor joined Jack in the air in a 503 Dream Machine for about thirty minutes. Jack had a GPS problem so he passed closed to the ground and Chris ran along side and handed him the small yellow Garmin. Jack then climbed to about 2000 agl and headed north to Jacksboro, a distance of 50 miles. Gene and Chris followed in the truck pulling a trailer. Radio contact and telephone contact with Jack was maintained. The upper winds were now about 20 mph. Jack arrived over Jacksboro and now turned East to Bridgeport, a distance of about 25 miles cross wind. Jack stopped over Bridgeport, facing into the wind, no forward speed and waited for the crew to catch up. He then turned North again and took off at 50 mph ground speed to Bowie. Once over Bowie, he again hovered to await the arrival of the chase truck. Gene and Chris arrived. By now Jack had used up both of the portable radio batteries and found out that the cell phone only works above 2000 ft agl. Approaching 5 hours in the air, Jack began the descent. The ground winds were gusting to 26 mph and it was a rough and slow process. Finally 5 hours and 2 minutes after his departure from Parker Airport, Jack Arnold touched mother earth. The wind refused to let him go, so even after cutting off the motor, he continued to lift off and finally slid backwards to a stop. A world endurance record of 5 hours and 2 minutes with the Buckeye and the new chute from Sycon. A video is being prepared of the flight and will be available. I think I have beaten the heaviest student record. student weight=350 pilot weight=190 582 Buckeye with lots of toys and full tank of fuel=400 total weight=940 lbs. climb rate never got over 100fpm full throttle of 6500rpm to mantain level flight. Most hours flown in a single day. Oldest pilot Make up your own! Most pages on this site are updated weekly. To maintain a balance throughout the entire PPC Industry, we accept articles, photos and sponsorships from every business & pilot that supports the integrity of the Powered Parachute community.